To merge two or more lists, use the Audience Builder to build a new list. You can either build a new Natural List, which will contain all users on multiple lists as they exist at the present time, or you can create a new Smart List, which will automatically update as new members are added or removed from any of the source lists. Methods for merging lists are described in further detail below. 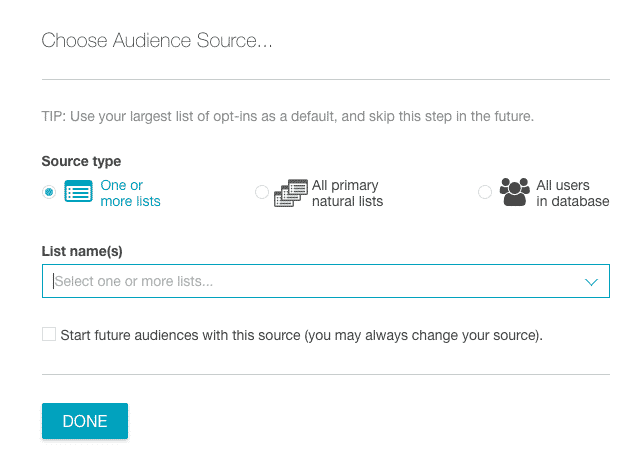 For more information, see the Audience Builder Overview pages. After you select Done, you’ll move to the main Audience Builder screen. Select Other Actions > Generate Natural List from the bottom menu bar. 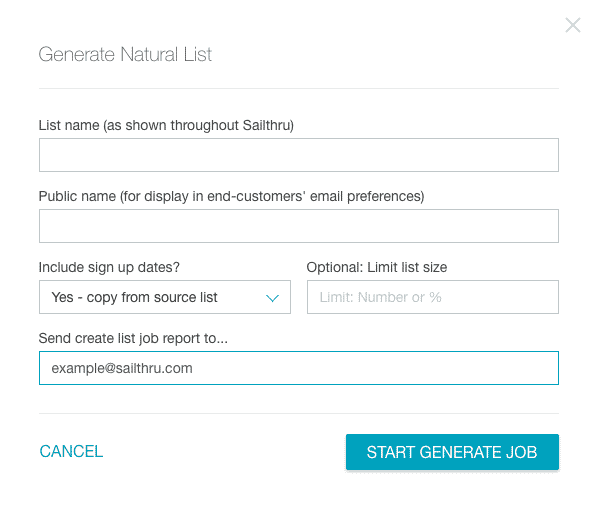 Give your list a name and select Start Generate Job. The new merged list will generate and then appear in your main Lists page. Mark the new merged list as “Primary” if you want to automatically receive detailed list reports. Select Save as Smart List from the bottom menu bar. Give your new Smart List a name and select Save. Since you are creating a new list, your original source lists will not be modified in any way by this action. They will still exist and can be found in your main Lists page. If you send to your new list, there will be no duplicates. Like any list, this new list is a collection of all unique user profiles across all specified sources.